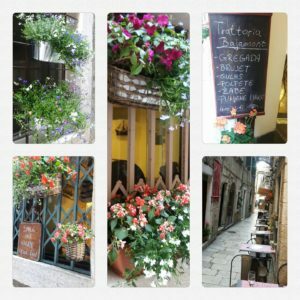 The Gecko has an abiding interest in all things food and has done some research and now provides you with the guide to the BEST RESTAURANTS IN SPLIT – 2019 – a culinary tour of Split to make it easier for you. Alternatively, why not join us on our Split palace and markets tour where we will explain and you can sample local produce in addition to us explaining and showing you some of the wider context of the culture and history of Split. Split restaurants are exciting. However, you need to know one thing about restaurant’s offer in Split (and elsewhere in Croatia): 90% of the Split restaurants serve the same menu. It is usually grilled fish, fresh pizza, pasta or risotto. Absent from all of this however is one of the greatest dishes in Dalmatia – the PEKA – see our Peka blog for that dish takes a lot of love and much time and that doesn’t work well with the full on tourist season in Croatia. To whet your appetite, here’s a short video of Split with a gastro bias Short Split video. Zrno soli is a fine dining restaurant located in town’s marina. Restaurant has a beautiful terrace overlooking the sea, boats in the marina and the town. The view over the lighted town is especially nice at nighttime. The food is fresh, well cooked, innovative, but it is not spectacular. However, it is a very good restaurant with beautiful views and friendly and efficient service. This is an upscale restaurant and the prices are high (as expected for such a place). This is one of the fine dining Split restaurants. Restaurant Kadena is located in the Zenta neighborghood. This is an upscale restaurant, serving Croatian classic dishes in an elegant way. From the outdoor terrace, Kadena offers wonderful views over the sea, and nearby islands of Brac and Solta. Great food and service, you may find that the restaurant is rather too large for your taste. This family-run tavern is one of the most popular places to have seafood in and around Split. The seafood here is fresh, local, and simply as good as it gets. Food here is prepared in a simple way, so fish remains flavourful, and tender. A bit hard to find, and out of Split, in neighboring Stobrec, but well worth the trip. One of the Gecko’s favourites – Not to be confused with Matejuska restaurant opposite – Tavern Fetivi (ex. Matejuska) is located close to the harbour. It’s a small, family-run restaurant with great atmosphere and excellent food. The restaurant can accommodate approximately 60-70 people, half inside, and half at their outdoor terrace. Reservations are needed, especially during the summer. The Tavern offers traditional regional dishes mostly based on seafood, but they have meat dishes as well. The offer changes with the season. The food is prepared in a simple way. Everything served here is very fresh and tasty. Service is friendly and prices are affordable. House wine is cheap and of a good quality. It is one of the highly recommended Split restaurants. Villa Spiza is a tiny, charming restaurant located in a small alley in the old town. This little hole in the wall place could be a bit difficult to find, but don’t just give up. If you get lost, just ask locals. There are only two tables for two outside and a counter seating for 7-8 inside. Counter seating inside has a direct views over the kitchen. The food is fresh and locally sourced. There is a daily menu based on what’s available and fresh. If you are looking for a fine dining and intimate atmosphere, this is not a place for you. But if you like authentic, fresh and unpretentious food, prepared in a simple way, this is a place to choose. Prices are reasonable. It is great value for money. This is one of the must visit Split restaurants but be there by 6.30pm if you want a table in season as its very popular. For those who follow Rick Stein, he waxed long and lyrical about the place when he previewed Dalmatian food. 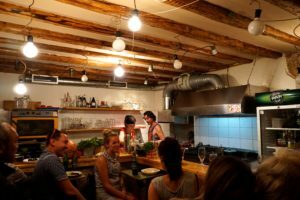 Uje Oil Bar is a tapas style restaurant, located at the heart of Split old town. It opened recently, in May 2013 and is expanding to other locations we heaar. 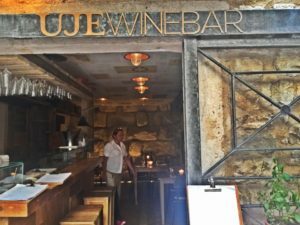 The place has a very good vibe, friendly staff, tasty food, excellent choice of olive oils and wines. The food is served on wooden boards, and in a tinware. The warm dishes’ menu is updated daily, while cold cuts, marinated fish, and a choice of olive oils are available daily. Prices are reasonable.We take in the this restaurant on our Split for Foodies tour. This lovely tavern with vaulted ceilings is located near Bacvice beach. It’s offers a typical Dalmatian (Mediterranean) dishes, made of fresh, locally sourced ingredients. It’s a real gem, and one of the rare places in Split where vegetarians (and even vegans) can indulge in more succulent and elaborate food (instead of eating side dishes in fish / meat focused restaurants). Menu changes seasonally. This wine and cheese bar has ‘Dalmatia’ written all over it with over 100 wines. Representing the diversity and quality of wines in this region, 50 wines are available to try by the glass. As well, they offer about 20 artisan cheeses that are primarily produced locally. You can pick and choose whatever suits your taste buds. They have friendly staff, many of which hold wine qualifications. They also have been mentioned in numerous national and international publications for their high-quality products and service. Professional tastings available. It can be crowded on summer evenings, especially over the weekend. 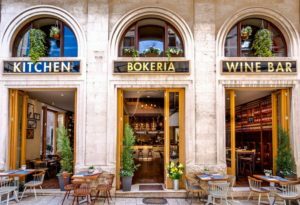 Bokeria is a new star on Split’s restaurants sky. Open in 2015, the owners of this place were inspired by Barcelona’s famed market – La Boqueira. This is the exact vibe they created in their restaurant in Split. In the day before Croatia was on the tourist map this was shareware storebut now the two-story interior is beautifully decorated, modern and airy. The menu includes a selection of Croatian tapas-style dishes, but also full meals. Menu changes seasonally. Excellent choice of Croatian wines! 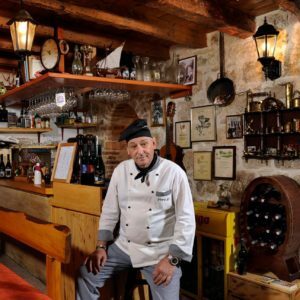 Tavern Tri Volta (Zalogajnica Dioklecijan) is a truly special place for people of Split. This restaurant has been here for 40 years. There is no fancy signs, and very few tourist come in. The place is not decorated in a fashionable way. Crowd is mixed, young and old, many people know each other, and the atmosphere is convivial. Food is honest, homemade, it is an excellent place to taste a working class Dalmatian plates. Restaurant Makrovega is the only fully vegetarian restaurant in Split. Since there are plenty of vegetarians visiting Split, I think it is important to list it here. They offer snacks and sandwiches, as well as daily buffet.